This is an eye-opening examination of the causes and dynamics of bias in the workplace, offering a psychological, political, and societal analysis of the actual cost of bias to the bottom line. The authors make the hurdles that women and minorities face in the workplace as personal to the reader as they are to those who face them. 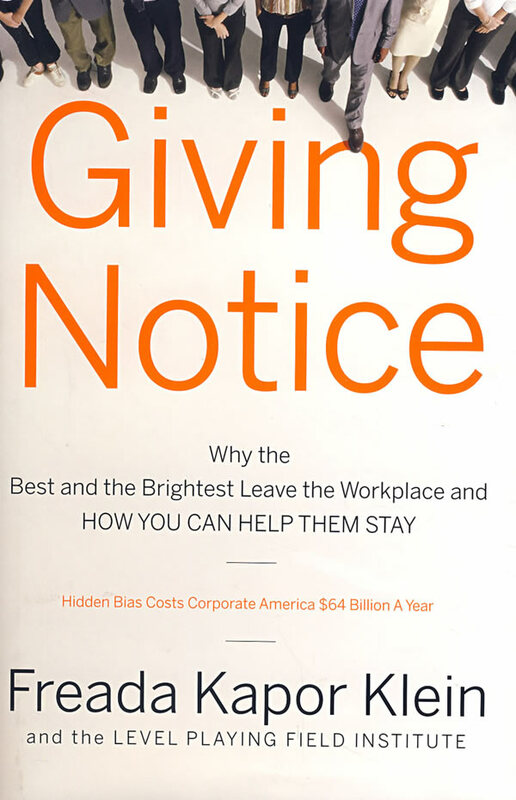 Giving Notice is filled with sensible approaches for solving the current imbalance and challenges us to rethink unconscious ideas about stereotypes and commonly accepted business practices. Freada Kapor Klein (San Francisco, CA) is an internationally noted consultant and diversity expert. She has been quoted in the New York Times, Chicago Tribune, Los Angeles Times, Washington Post, and on the Today show, Nightline, and NBC Nightly News. Kimberly Allers (Bayshore, NY) was a writer at Fortune magazine and is a frequent guest speaker at professional development and women-oriented seminars. Martha Mendoza (Santa Cruz, CA) is a national writer for the Associated Press. She won a Pulitzer Prize for investigative reporting. Freada Kapor Klein co-founded the Level Playing Field Institute. Based in San Francisco, the LPFI is dedicated to improving fairness and opportunity in the workplace through educational programs and workplace training. LPFI strives to identify and remove hidden barriers from the classroom to the boardroom.Kimberly Allers, a writer at Fortune magazine and senior editor at Essence, is a frequent guest speaker at professional development seminars.Martha Mendoza is a national staff writer for the Associated Press. In 2000, she won a Pulitzer Prize for investigative reporting.